The next meeting of the Club Executive is on Wednesday, the 5th November 2014, at 8pm in the GAA offices in Pearse Park. The AGB Table Quiz will be held in the Old Ship on the 6th of November 2014 at 8pm. The table quiz is supporting Cian McBride’s Shave or Dye campaign in aid of St. John’s Cancer Ward & The Cardiac Unit – Our Lady’s Children’s Hospital. Raffle on the night with some fabulous prizes including a Weekend B&B Break in the Croke Park Hotel, Dublin. Finger Food also provided on the night! Table of 4 is €20. The AGB Ladies Admins/Coaches night out will be on Saturday, the 8th of November, in the Harbour Bar at 8pm. Music and Food will be served. Special free draw for all Admins/Coaches. Also on the night we will be having our Ladies Presentation for the player of the year (Minor, Junior and Senior) and club person of the year awards. Presentation will be at 9.30pm sharp. A social night for adult AGB players, managers, admins and members has been organised for Saturday the 15th of November in Shelbourne Park. Depending on numbers, a bus will be provided from Arklow, free of charge, and finger food will also be provided after the races. Tickets are just €20. Contact Ray Menton, 085 1642221, or Mick Healy, 087 2363603, to book your place and for more information. Race Night Info from Wicklow County Board at www.arklowgaa.com. Club AGM is on Friday the 5th of December. Ladies AGM is on Friday the 21st of November. Juvenile Boys AGM is on Friday the 21st November. Calling all musicians, singers, actors, dancers!! Join Kathryn in Gaelcholáiste na Mara. All interested 6 – 17 year olds should meet from 12pm to 2pm on the 4th Sunday of each month, next one on the 23rd of November. Contact Kathryn on 086 8664931. For poster see: Scór na nÓg at www.arklowgaa.com. There will be an U8 – U14 Girls Mini All-Ireland Tournament on Saturday the 8th of November from 10am – 2pm in Pearse Park. 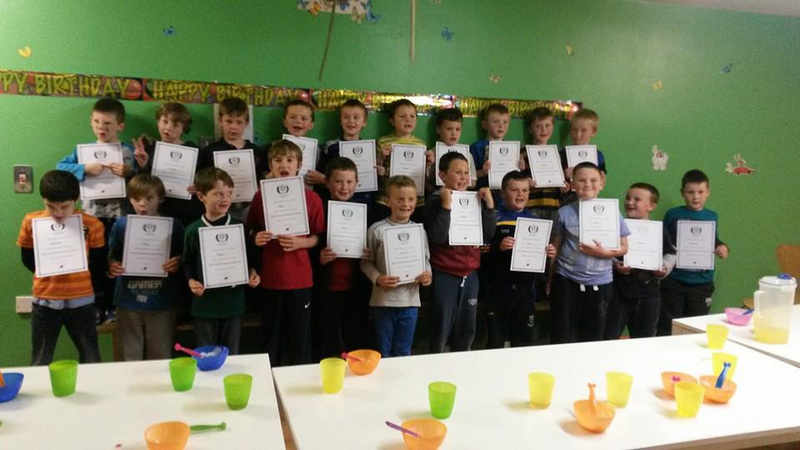 The AGB U8 Boys had their end of season party in Funworks on the 28th of October. A great day was had by all to top off a great year. The U10 boys were out in their last game of the season on Saturday the 1st of November. Well done to all the boys who took part. 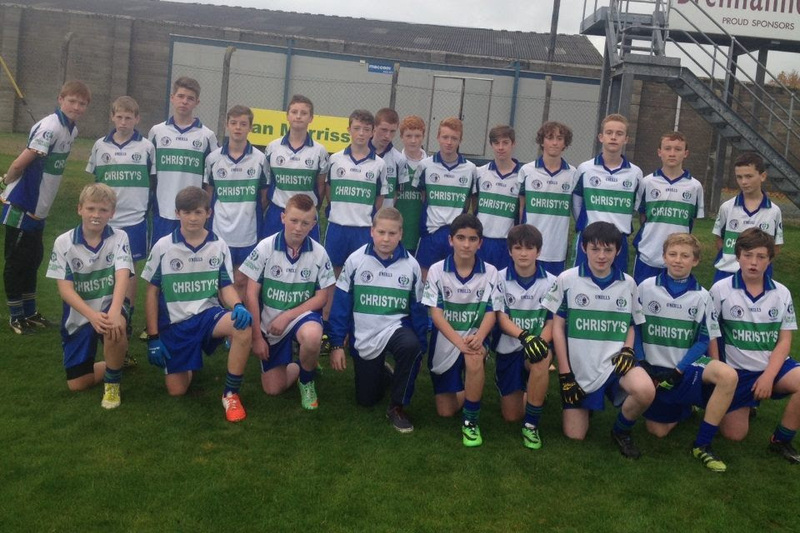 The AGB U14 Boys were unsuccessful in County B Championship Final against Carnew on the 27th of October. It was just not AGB’s day but parents, supporters and the Club are very proud of the effort the boys put in on the day and the year to date. It is a great achievement to reach the final. Best of Luck to the boys in their U14 B Shield Final to be played on the 15th of November in Laragh at 2.30pm. AGB U16 Boys play their Championship Final on the 22th of November. Time and Venue to be confirmed. The U16 and Minor girls ended their season off fearlessly with a trip on the Ghost Train in Glenart on Wednesday 29th October 2014! To get their strength up for the big event the girls went to the Asian Harvest Restaurant. After dinner the U16 player of the Year was announced by team manager James Furlong and the trophy was awarded to Kayleigh Earls. The group then assembled at Glenart for the Ghost Train Ride. This was a superbly organised event which everyone enjoyed and after a considerable amount of screaming, abductions and supernatural attacks, all were laughing again by the time they exited the gates of Glenart Castle. Well done to Orla and Jennifer for organising the event and managing to get everyone home alive at the end of it! Many of these girls will be attending the Adult Ladies Presentation Night on November 8th in the Harbour Bar as they supported both the Junior and Senior Panels this season. The Minor Player of the Year will be announced at the adult presentation along with the Junior and Senior Recipients. For full report see: U16 and Minor Ladies Celebration Night at www.arklowgaa.com. For all upcoming AGB fixtures and events please go to: Fixtures at www.arklowgaa.com.